The tyrants who rule the Light Universe pass their essence onto their successor upon their demise, while their still-conscious brains are kept in a vault; their chief resource is Lexx, the most-powerful mobile weapon in the universe, which can only be commanded only by the keeper of the hand-key. The previous incumbent wiped out the Brunen-G race, except for Kai, whom he kept in a state of amnesiac suspended animation, to be revived by proto-blood for short periods and used as an assassin. Into this background comes anti-hero Stanley Tweedle, an ignored non-entity clerk, who misses an appointment and is branded a criminal. In the dungeons, overweight Zev has been convicted of not fulfilling wifely duties, and is being transformed into a gorgeous, svelt love-slave. Meanwhile, captured terrorist Thodin, due for public execution, escapes with his gang&#39;s help, and causes chaos, setting into motion Tweedle&#39;s accidental theft of Lexx and new ownership of the hand-key, Zev&#39;s escape with her new body and the characteristics of a giant reptilian attack worm but before mind-wipe (which goes instead to a robot head), and Kai&#39;s release to combat the terrorists before his memory returns! Tweedle, Zev, the lovesick robot head, Kai, and the stolen tyrants&#39; brains head off in Lexx to vaporise tyrant planets and find a place for themselves in the Dark Universe, while searching for a supply of proto-blood before Kai expires... A group of disparate fugitives from an interplanetary tyranny find themselves in control of a massively powerful starship. This is my favourite TV sci-fi to date! Totally different to your usual Star Trek, this tv programme doesn&#39;t take itself seriously Star Trek fashion and the humour is entertaining.<br/><br/>What makes this so great is its originality. This is the virtually the opposite of every cliche you see in sci fi. For example....<br/><br/>1) Stanley Tweedle. He is a coward, but oddly endearing in a way, you have to feel sorry for him. His antics are also ridiculous! He is also the commander of the Lexx and he&#39;s definitely no cowboy Captain Kirk.<br/><br/>2) The Lexx. No flash chrome coloured starship, but a gigantic, insect spaceship that eats its prey! It also behaves as though its alive - because it is!<br/><br/>3) 790 robot head. Has more of a personality than Data, in love with Zev, how&#39;s that for originality?? ?<br/><br/>4) Kai, the 2000 year old dead Brunnen G &#39;anti-hero&#39;. His attitude toward Zev is completely the opposite of how a &#39;normal&#39; hero would behave toward her! 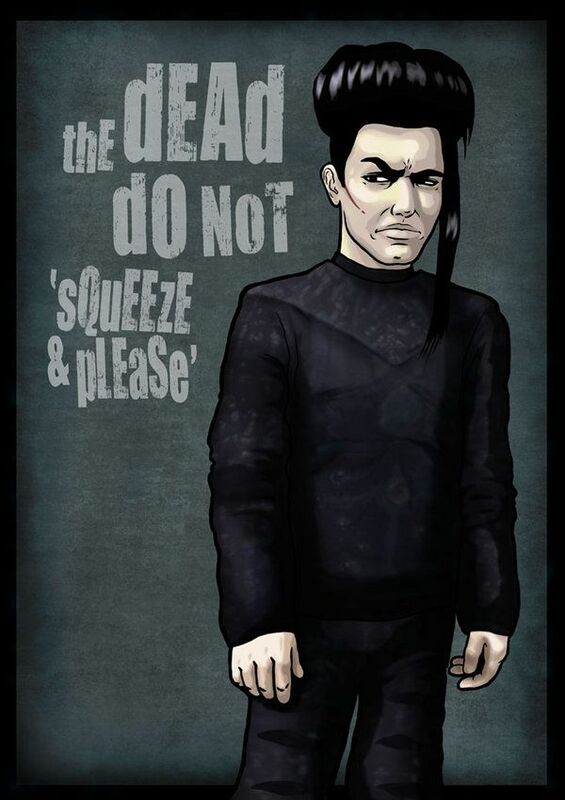 And also Zev, being part cluster lizard...<br/><br/>Having only recently found out there is a Lexx series on the net, we&#39;ve yet to see it here in NZ. This will be the third time the original series has been aired this year! I look forward to seeing it in the (hopefully) near future... I have to congratulate whoever came up with &#39;Lexx.&#39; It is the least Hollywood influenced series I&#39;ve seen since Babylon 5. The story and costumes are completely new, the acting perfectly suited for what is needed, and the effects certainly enough to fascinate viewers.<br/><br/>One of the scenes I liked best was in Episode One, which has a His Shadow ship attacking the homeworld of the Brunnen-G. Kai and several other ships fly to attack it, all chanting the same war song in time with each other. Very creepy, very poignant, and very rarely seen before.